Learn more about using the BISSELL Big Green carpet cleaner rental. By clicking on any of the questions below you can get additional information about removing difficult stains, cleaning stairs, extracting water and more. Our rental deep cleaners are specifically designed to remove deep down dirt and odors from your carpet. Get more information about our innovative rental deep cleaners and find a BISSELL Big Green carpet cleaner rental at a retailer near you today. The Big Green® does not contain a heating element. Using hot tap water provides optimal cleaning. Do not boil or heat water in the microwave. Can I use an extension cord with the Big Green Deep Cleaning Machine? No, an extension cord should not be used with this product. The Big Green Deep Cleaning Machine has a 25 foot cord to assist you with your cleaning needs. Can I clean Berber, wool, area rugs, shag and oriental carpet with the Big Green? Are there any types of carpeting that should not be cleaned with the Big Green? BISSELL recommends that you check your carpet manufacturer’s instructions before using the machine on any type of carpeting surface. Also, make sure that your area or oriental rugs have a solid backing before using the Big Green to clean them. Extra caution should be taken when using this machine on frieze carpet. How do you clean stairs with the Big Green? 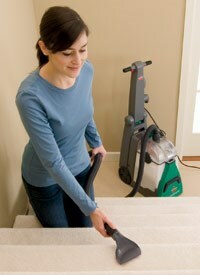 Stairs can be cleaned with 6-inch stain tool and 9-foot hose that are available for an additional rental fee. The hose attaches to the machine and uses the same formula and water mixture that is used for carpets. The best solution for cleaning difficult spots and stains is to use one of BISSELL’s pre-treat or spot and stain remover products: Heavy Traffic®, Pet Urine Stain & Odor, or OxyDeep® Pro. How much does the Big Green Deep Cleaning Machine weigh? The Big Green weighs about 42 pounds empty. Can the Big Green be used on any hard surfaces? No, the Big Green is intended for cleaning carpets and upholstery only. It should not be used on any hard surfaces. Can the Big Green Deep Cleaning Machine be used to extract water? From a flood for instance? No, NEVER use this machine on carpet or anywhere where standing water remains. This product should only be used on carpet moistened by the cleaning process.